I'm sure I'm going to be accused of being a conspiracy theorist, but I've had my suspicions for quite some time now. And this last week, when the FBI and the Department of Homeland Security issued reports stating that for more than a decade “international terrorist groups and associated individuals have expressed interest in using fire as a tactic against the Homeland to cause economic loss, fear, resource depletion, and humanitarian hardship,” it tends to make me sit up and take notice. You should know that different law enforcement agencies have long suspected that fire could be used as a weapon, because it is inexpensive and you don't need a lot of technical expertise to light a match. Combine that with the EPA's reluctance to clear brush and undergrowth, and you've got a formula for disaster. But the real clincher that finally has the alphabet agencies paying attention is a slick online publication called Inspire. This online magazine is reportedly produced by Al-Qaeda in the Arabian Peninsula. The most recent issue of Inspire featured multiple articles on the use of wildfire as a weapon in jihad, including a complete guide on creating an “ember bomb” that would likely have a “high failure rate when manufactured and utilized by untrained or inexperienced personnel” according to the DHS report. Is that supposed to make us feel better? The FBI has also separately warned about the latest issue of Inspire, which “instructs the audience to look for two necessary factors for a successful wildfire, which are dryness and high winds to help spread the fire. Specific fire conditions that are likely to spread fire quickly are Pinewood, crownfires (where the trees and branches are close together), and steep slope fires (fire spreads faster going up a slope).” California and Montana are specifically listed in Inspire as potential targets. I don't know about you, but this scenario sounds totally reasonable. About 2.9 million acres burned each year in the U.S. between 1985 and 1995, but since then, the average has jumped to more than 6 million acres annually, including at least 5.9 million that burned nationwide in 2009. There has to be a reason for the dramatic jump, don't you think? And since these FBI and DHS reports state the threat has existed for more than a decade, it didn't surprise me to read this statement by Rick Ochoa, the fire weather program manager at the National Interagency Fire Center in Boise, Idaho: "We are seeing a significant trend. Over the last 10, 12 years, fire activity has been much higher than normal." Hmmm, let's see .... when did Al-Queda strike the Twin Towers? Oh, yeah. Almost 11 years ago. Coincidental? And this last week was no exception. 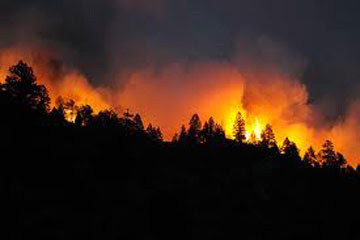 Fires raged across Colorado and New Mexico. I know that there could be other reasons for these fires. U.S. fire departments reported over 24,000 fires caused by lightening strikes in 2004-2008. I find it a little less believable that global warming is the reason for the increase in the last decade, although I'm sure the EPA would like us to buy into that theory. Nevertheless, I believe this is a very real threat and present danger to our nation. I'm not sure what we as individuals can do to stop it, except be vigilant and alert. The continuing drought across the nation is not helping either. As for me, I will pray for rain and for the Lord to confound and confuse. We face enough threat of fire from Nature; we don't need a terrorist campaign by fire. Jeremiah 23:29 "Is not my word like fire,” declares the LORD, “and like a hammer that breaks a rock in pieces?" Your post was very interesting, something I hadn't thought about. Where I live in California fire is a very real threat. We've already had 3 close by. One I could see the flames from my house. Two years ago we had a huge fire that went on for over a month. It was started by someone lighting a series of fires along the canyon road. Thanks to our wonderful firefighters no one was injured and no one lost their home. God bless our firefighters they are wonderful men and women who risk their lives for us. The more I see wants happening in our Country the more determined I am to have the word of God firmly planted in my soul. God MUST be the center of our lives or we don't stand a chance! And we have a long way to go to get through this summer. I have a close friend who lives in Colorado Springs and I've talked with her different three times now since that fire has progressed and she said it is darn right scary and it's close and they're prepared to leave if necessary. She said she has never seen anything like it ever. She also mentioned last night in our conversation over the phone that there is "a lot" of talk about this fire being started by an arsonist. Makes sense in what you mentioned in your post today. With all these fires out of control throughout our country, Obamacare being passed as the news has broadcasted today and the state of our economy, I'd say we have some real serious issues to deal with. By the way,I don't find you in the least of being a conspiracy theorist at all! I TRULY APPRECIATE YOU bringing these situations and information to the forefront and attention to those who are willing to pay attention! We need many, many more people to get on board and take a good hard look at what is going on out there and do something about it instead of thinking everyone else is going to take care of it for them. That just isn't going to happen in the long run! Ignorance is NOT BLISS folks! Thanks for all you do Belle! Let us all pray to GOD for these people that live there, those that are trying to put these fires out and ask to bless them with safety and all the beautiful wildlife and that God will restore the land and help those that are being affected by this tragedy. I am currently on the road in Colorado and feel the tension about the fires and the Supreme Court decision (I am going to let the dust settle and gather my thoughts while I'm traveling over the weekend, and I will have a post this next week on that situation). I'm not too sure that our country is so far gone, with no indication that we are willing to repent. God must be so grieved! You're right, and we need to keep praying!!! What has made us a great nation is the confluence of all the nations who have come here for freedom. But when new immigrants do not appreciate what we have to offer, and actively seek to destroy us, then it is not a good thing. We just have to remember that God is in control and He is aware of what we are experiencing. Pray to Him, people!